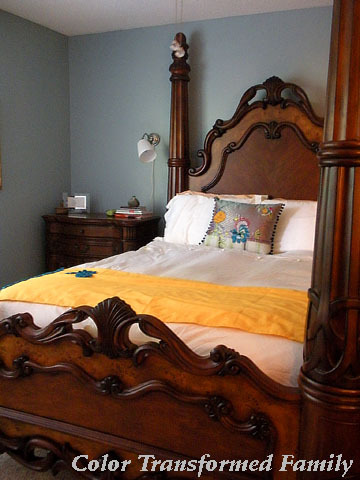 I loved our bedroom at our house in Birmingham. 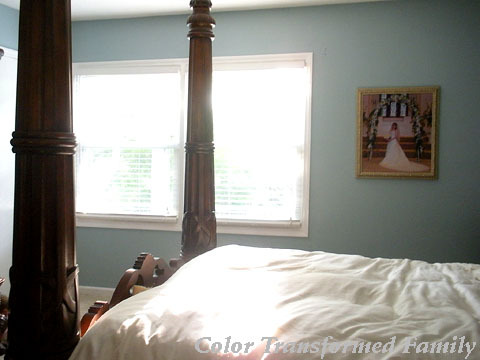 The soothing blue walls and white bedding created a calming atmosphere to help us unwind at the end of the day. Michael Luke and I are enjoying the challenge of creating the same peaceful feeling in our new bedroom. An apartment is temporary and for the most part people don’t paint the walls and whatever flooring is installed is what you are stuck with. That leaves us with the coveted beige walls and cut pile carpets. It’s not necessarily a bad thing though. 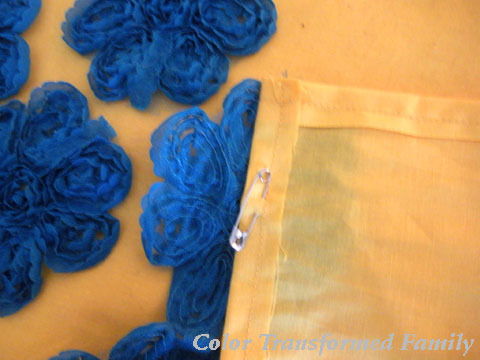 It leaves plenty of opportunity to incorporate color in other ways. 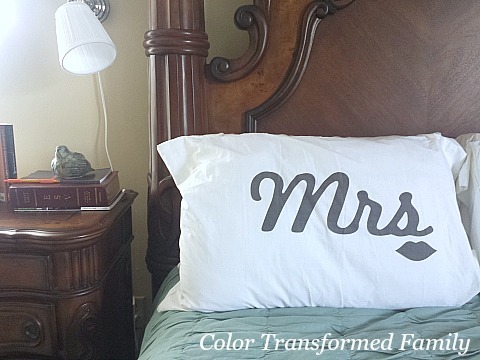 Once we finally made it past all the boxes and unpacking… that takes forever, we began planning ways to incorporate color and personality into our bedroom. To start with we realized that our white bedding just wasn’t going to work here. It didn’t necessarily look bad but it certainly didn’t do anything to enhance the place. Plus,it gave Michael Luke an excuse to purchase a new comforter because ours was a weighty down comforter that gets pretty warm during the Summer months. So, while we were in Birmingham last month visiting with friends we stopped at World Market. I love the patterns and colors that can be found there. 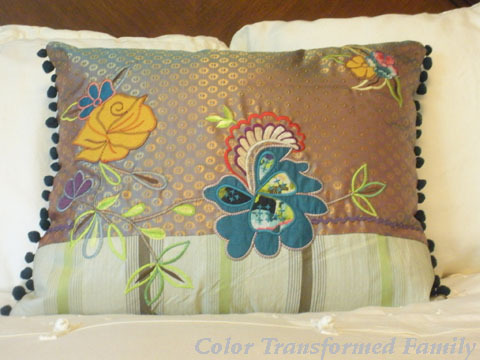 We went initially to look at draperies but got side tracked when we saw this comforter and pillow shams on display. Mr. is my pet name for Michael Luke. So, we felt like they were perfect. 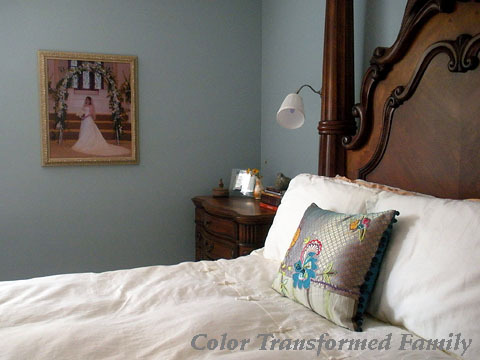 The blue comforter also reminded us of the color of our bedroom walls in Birmingham. 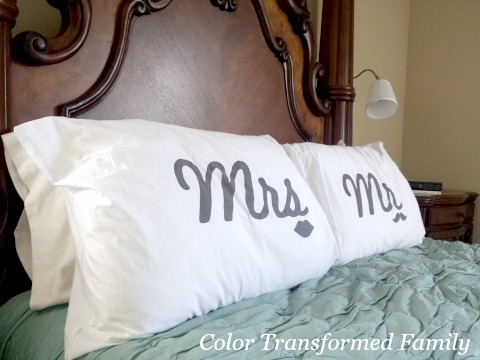 A new comforter is a great way to bring in color to the bedroom and it provided us with a springboard in selecting new draperies. More on that later. Another plus is that we bought the floor model because this particular comforter had been discontinued. Which means we were able to get it at a 10% discount! 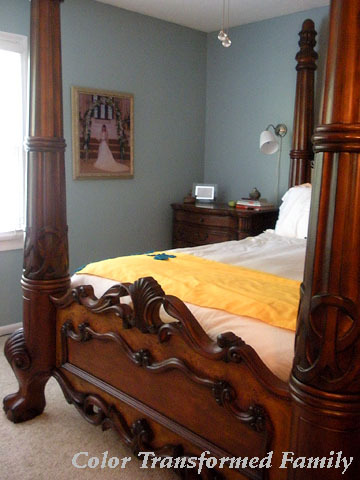 Next up in our master bedroom makeover is draperies and then the addition of more artwork. One thing is for sure though. It’s nice to finally have a relaxing and calming bedroom to unwind in at the end of the day. 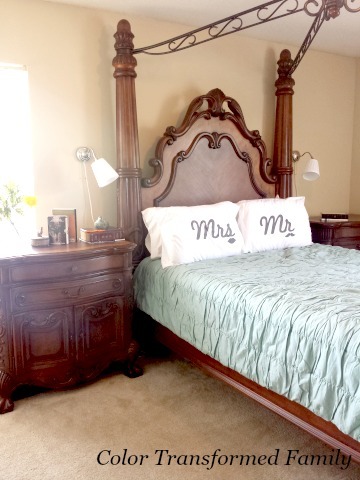 This entry was posted in Master Bedroom and tagged apartment bedroom, Master bedroom on 06/18/2015 by Krystle. I promise this is design related. Here on the blog I regularly mention our little girl, Noah (here, here, and here). Occasionally, I mention our yorkie, Emma (here and here). 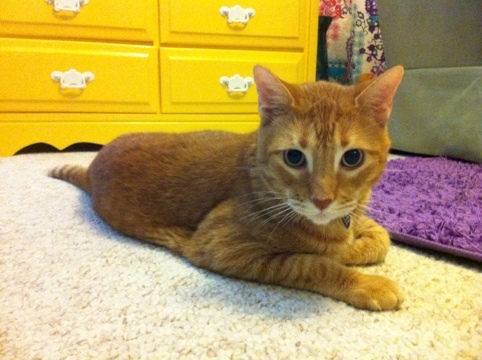 But one of our family members I neglect to mention is our orange tabby, Buddy. Buddy has been around a while… longer than ML and I have been married. We adopted him from the animal shelter back in college and will turn eight this Thanksgiving. Up until we moved to Birmingham Buddy lived with ML and three other guys. This led to a very rambunctious beginning for Bud but he has matured a little over the years. If you’re still reading I promise we are almost to the design part of the post. You see Buddy likes to sleep on at the foot of our bed. Not on the floor at the foot of the bed but on the mattress at the foot of our bed. I realize not everyone is a cat person and letting animals sleep on the bed with you may not be everyone’s cup of tea but we enjoy it. The only problem is we have a white/cream duvet cover and an orange cat. Are you getting the picture here? He sheds. A lot. And it’s not white. We tried to remedy the problem by placing this scrap piece of bedding at the foot of the bed for him. Some nights he uses it ,other nights he prefers to snuggle closer to our feet (off of the fabric). 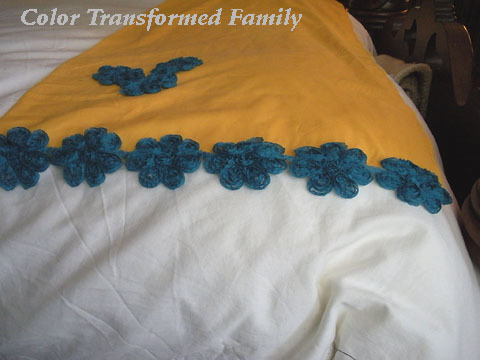 So I decided to make a faux blanket of sorts to place at the end of the bed (for the cat). All I wanted was a piece of fabric that would lay over the duvet cover and that could be thrown in the wash. 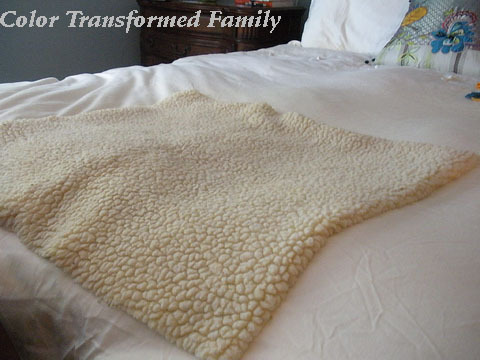 I was able to make this faux blanket for just under ten bucks! Noah and I paid a visit to Jo-Ann the other week. We took the accent pillow from our bed to use as inspiration. 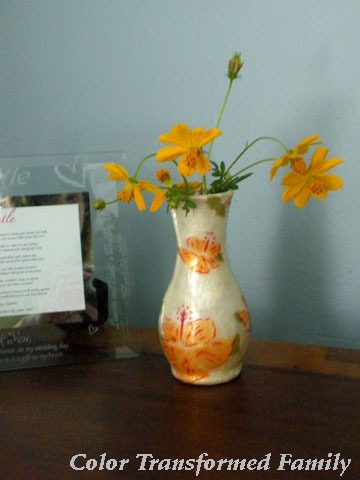 I wanted to pull out the yellow in the pillow because I had already used it in the vase on my nightstand and I hope to incorporate it into some art work later. Plus yellow blends in with his orange fur. After selecting the yellow broadcloth and matching thread (that was also 50%) off we stumbled across this beautiful trim. 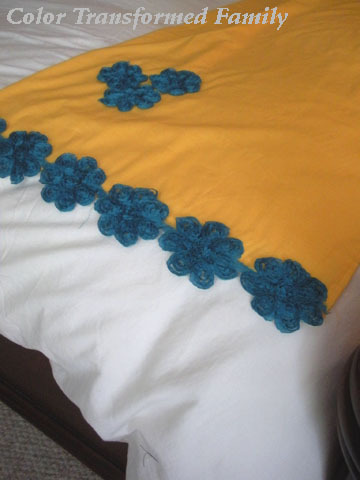 Making the “blanket” was very easy. I bought five feet of fabric, sewed a 1/4″ hem along all the edges, and then folded it in half. Next, I cut enough trim for each side, safety pinned to the edges of the fabric, and then used the left-over trim as decoration. Ok, so did anybody catch the part where I safety pinned the trim? It’s not fancy or anything but it does make it easily removable so that I can wash the fabric without damaging the trim. 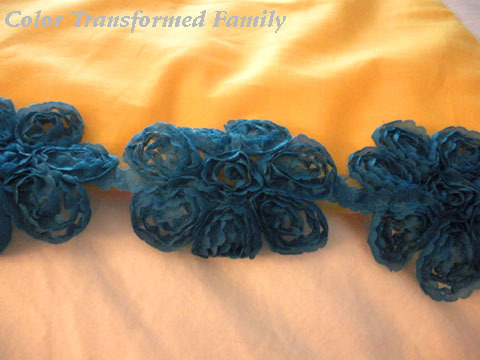 I would like to go back and sew snaps on the fabric and trim for a more finished look but this will work in the meantime. So now we have a nice looking blanket for our cat at the foot of the bed. Which is helpful because we didn’t always remember to fold up the other scrap of cloth. Which completely doesn’t jive with the rest of the design of the room. The faux blanket we can leave out during the day if we want and works with the rest of the room. I told Buddy he should feel pretty special that I made him such a nice blanket. So what does Buddy think of it? He likes it. I wish I could offer you proof but he only jumps on the bed after we turn the lights out. I think he thinks that we can’t see him up there if the lights are out. 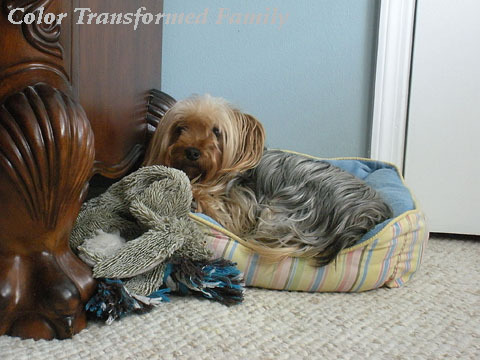 Have you ever made an unusual project for your pets? Or have to accommodate them in strange ways? 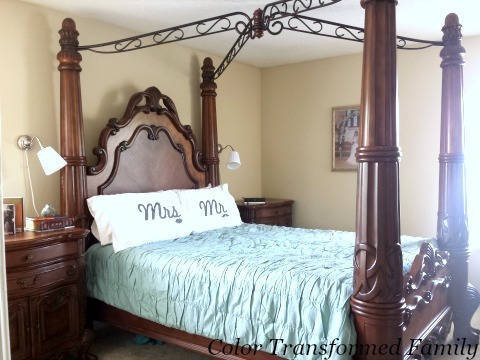 This entry was posted in Color, Master Bedroom and tagged blanket, Master bedroom, pets on 08/28/2012 by Krystle. 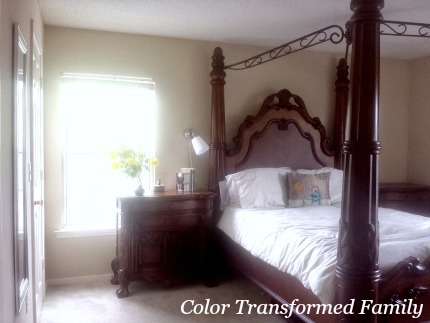 Friday I shared a shot of our newly painted master bedroom. Today I’m back to share the rest of the room with you. 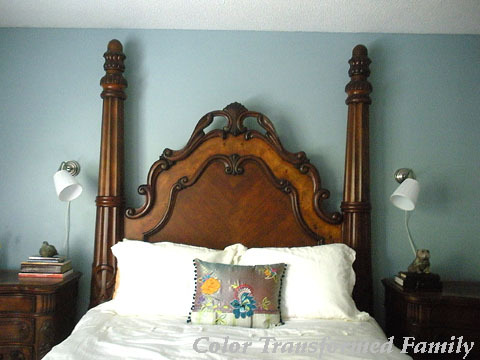 We chose to go with Sherwin Williams Rain for the color. 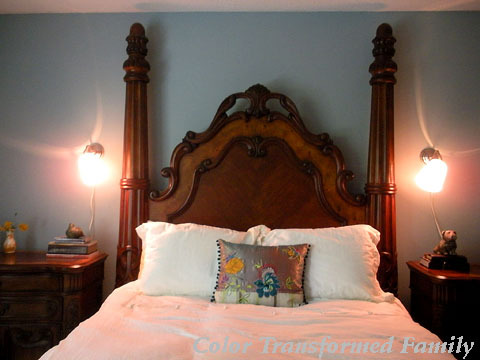 It is definitely a calming color and really opens up the space. We also gave the trim and doors a new coat of white paint. 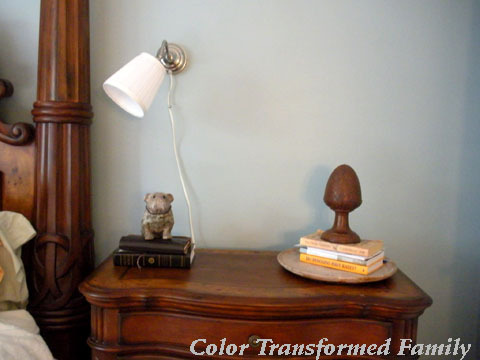 The previous color was a little more cream and covered with drips and strokes of every previous color the room had been. It’s so nice to have all that covered up. Fresh trim really makes the room feel like a new space! 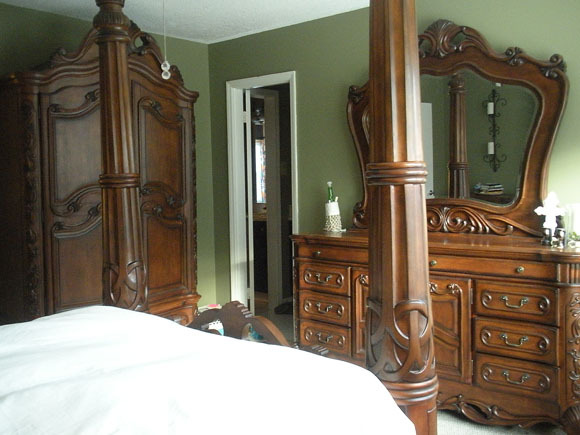 … from bed looking at dresser and door to bathroom. 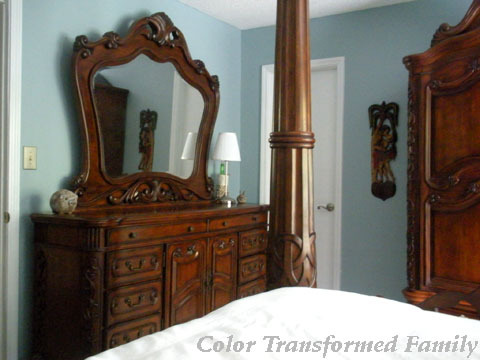 Doesn’t the paint make a wonderful backdrop for our furniture? Blue and red are really power houses of color but work well when paired together. 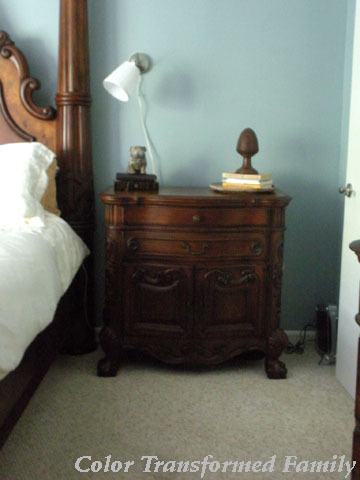 Especially as a soft blue and rich dark wood tones. It is so refreshing to wake up in this room every morning! I mentioned the other day that the room feels larger. 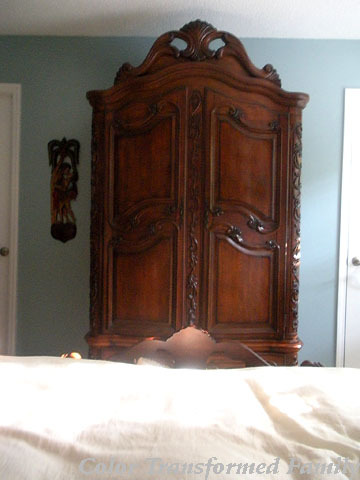 In a way it does because we switched the placement of the dresser and armoire. but I’ve gotten used to and really enjoy all the air space it created coming into the room and heading into the bathroom. Visually you are able to see more as you enter the room so the room actually appears larger. It also works great because I have been using the mirror above the dresser when I get ready in the mornings (standing up, not in bed). Mainly because I like to get ready while Noah naps and since both of our rooms are connected to the bathroom it’s best if I rumble through my makeup bag in our room. I added a few pieces of McCarty pottery to the room also. They are made from Mississippi mud and have little streaks of blue in them that work well with the color scheme. I finally got to hang these little beauties too! We bought them back in April when we paid a little visit to IKEA. This might actually be my favorite part of the transformation. I can’t tell you how long I have wanted lights on the wall for reading. 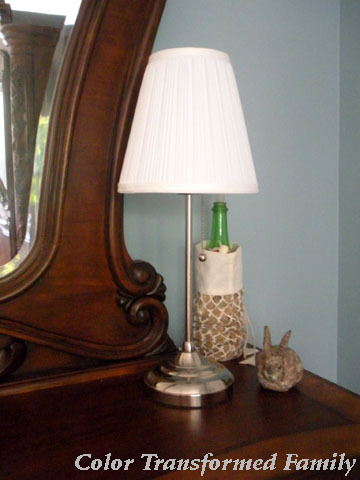 Before, I has a beautiful lamp that I found at a thrift store several years ago. I still love it but it wasn’t that great functionally. I always had to get out of bed to turn it off… which is never great when you practically read yourself to sleep. It never looked right sitting closer to the bed because it left a huge void between it and the wall. 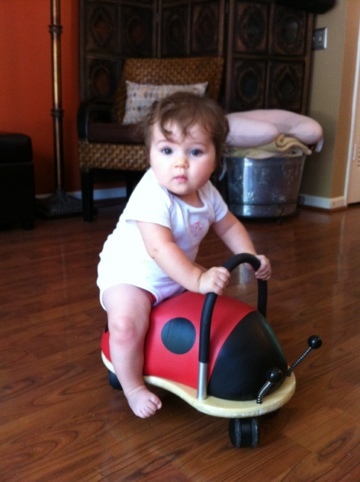 Trust me… it looked funny. 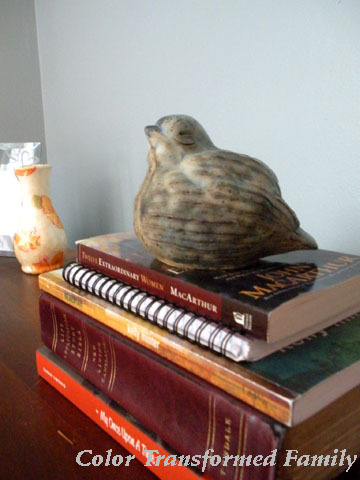 The wall lamps work with the space visually and really help to clear up a little space on my night stand. 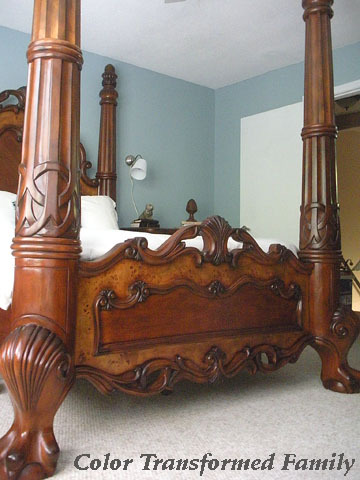 It’s hard to get a good shot of the front of the bed. This one is looking at it from my closet. It also gives you a glimpse of the door to our room and the landing at the top of the stairs. 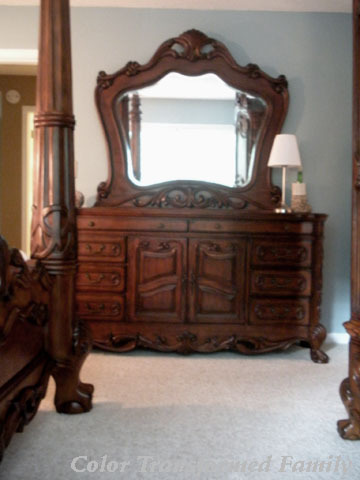 I mentioned the other day to someone that this furniture reminds me of the furniture from Beauty and the Beast. Partly because of it’s ball and claw feet and the shell designs on it. 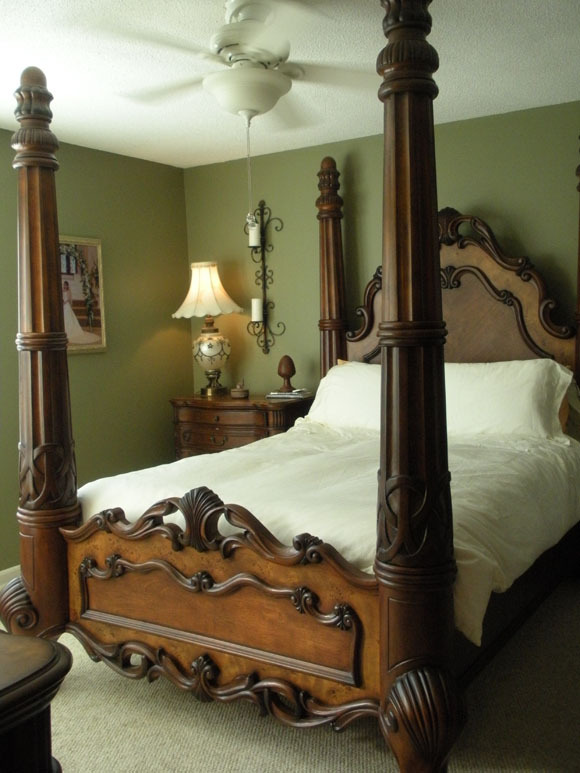 Can’t you just picture the bed coming to life and walking off. Random I know… but I thought I would share. 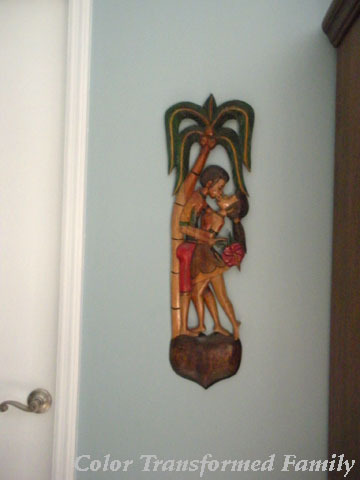 With the new arrangement of furniture we are excited to finally be able to showcase this piece of art we bought on our honeymoon to Jamaica. We love that it has meaning behind it and plan to continue to add art work from our travels together as a family. So that just about brings our tour of our bedroom to a close. Emma really wanted to show you where her throne bed sits now though. 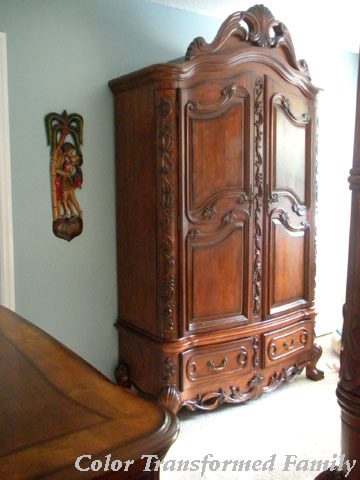 It’s snuggled up between the armoire and closet door. A slight move from it’s previous spot underneath the window. Thanks for stopping by to check out our updated room. We have a few more minor updates for it but are tickled pink blue to have the major work behind us. 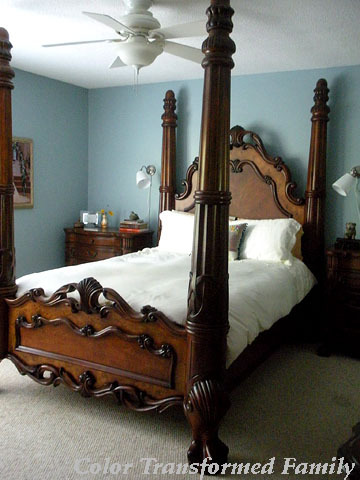 Have you undertaken any major painting projects lately? 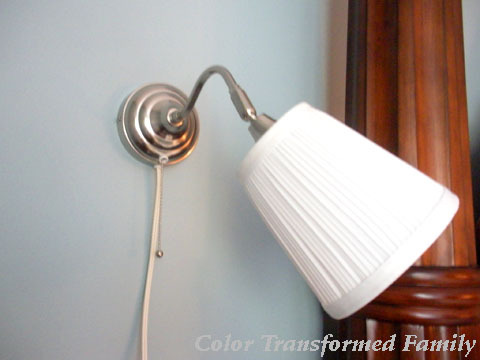 Do you have a lamp or wall lamp that you read by at night? Or are you one of the hight tech ones that has graduated to a Kindle or iPad? We’re still holding out. 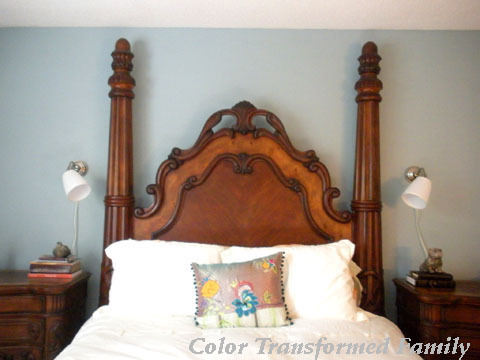 This entry was posted in Color, Master Bedroom and tagged DIY, Makeover, Master bedroom, paint, renovation, Sherwin Williams Rain on 08/07/2012 by Krystle.